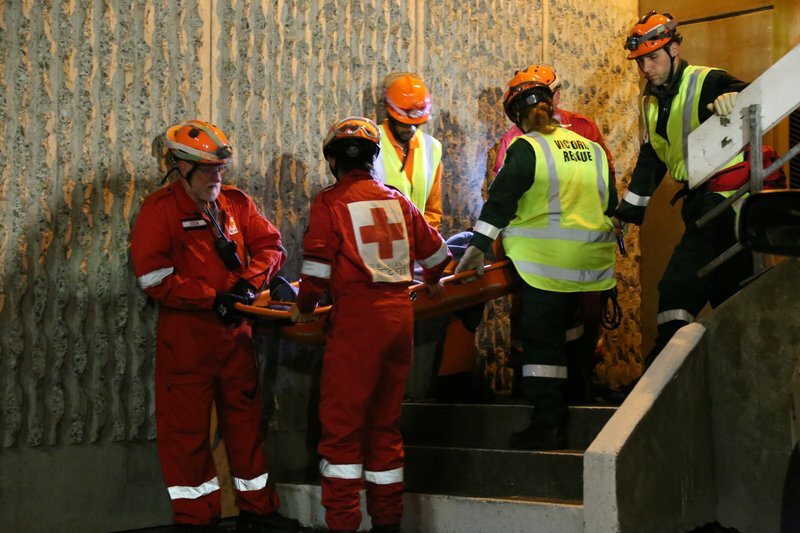 When a major earthquake hits Wellington, Red Cross volunteers Gaye and Mandy – the women in red – are ready to help. Red Cross DWST volunteers Gaye (left) and Mandy take a break during a training exercise at Victoria University of Wellington. I can hear injured people calling for help. There’s just been a major earthquake and here, at Victoria University in Wellington, there are several casualties. Among the first responders are Gaye Campbell and Mandy Sexton. Wearing bright red overalls and hefty work boots, the two are all action, searching stairwells, checking pulses and dressing wounds. Mandy and Gaye are members of Red Cross’ Kapiti-Mana Disaster Welfare and Support Team (DWST). Tonight, the team is sweeping across the Victoria campus, searching for survivors of the devastating earthquake. Except, this time, the earthquake’s not real. As the team ferries a man in a stretcher down a narrow outdoor staircase, a couple of students, fresh from an evening exam, stop in their tracks. Training exercises like this are a regular commitment for Red Cross volunteers across New Zealand. Red Cross has 18 emergency response teams around the country, on call 24/7 so they’re ready to go whenever they’re needed. When a flood, earthquake or tsunami hits, Red Cross responds immediately, providing first aid, carrying out reconnaissance and rescue, and coordinating welfare support centres. So, while tonight’s earthquake is just a drill, it’s helping volunteers like Gaye and Mandy prepare for the real thing. Gaye has been part of the Kapiti-Mana team for about 18 months. She signed up after becoming semi-retired and finding she had extra time on her hands. “I’m not a knitter or any of those sorts of things. This is a really good, practical way I can help people,” she says. Gaye was able to put her training to use during the Whanganui floods in 2015, where she worked in the welfare support centre helping evacuated families. Gaye’s teammate Mandy, a mum from Pekapeka, has been with Red Cross for nine months. She joined the team as a way to continue using her nursing skills while also gaining new ones. “I’ve seen the international Red Cross in action and I wanted to be able to keep using my skills to help in the community. The training provided by Red Cross to DWST volunteers, which includes sessions like tonight’s mock earthquake, covers a wide range of topics. Volunteers learn and practise everything from first aid and ground-level rescue to medical ethics and stress management so when an emergency occurs, they can provide the best possible support. Being on call 24 hours a day, 7 days a week means having a supportive workplace and family – ready to care for children or pet dogs at short notice – is a necessity. However, Mandy and Gaye agree it’s worth being part of a team that’s able to help people when they need it most. “Red Cross is just an amazing organisation. It’s all over the world, it’s totally inclusive of all people, it makes no judgement at all – it just provides help where it’s needed,” Mandy says. Red Cross is looking for more Kiwis to volunteer as DWST members. If you’re interested in joining your local team and helping in a disaster, apply to become a member today.